Fire contains a lot of energy. Fire helped man to survive, but on the other hand had some catastrophical results. This form should be performed rhythmically, with some outbursts of energy. 22 Movements, 0 kicks, 5 punches, 2 keup. Begin in a ready stance (Joombi). Left turn 90° (West), left front stance, left hand low block (Ap Kubi Arae Makki). Step up right front stance, right middle punch (Ap Kubi Momtong Jureugi). Right turn 180° (East), right front stance, right hand low block (Ap Kubi Arae Makki). Left turn 90° (North), left front stance, left low block (Ap Kubi Arae Makki). Step up right front stance, right hand high block (Ap Kubi Olgul Makki). Step up left front stance, left hand high block (Ap Kubi Olgul Makki). Step up right front stance, right hand high punch. KEUP! (Ap Kubi Olgul Jireugi). 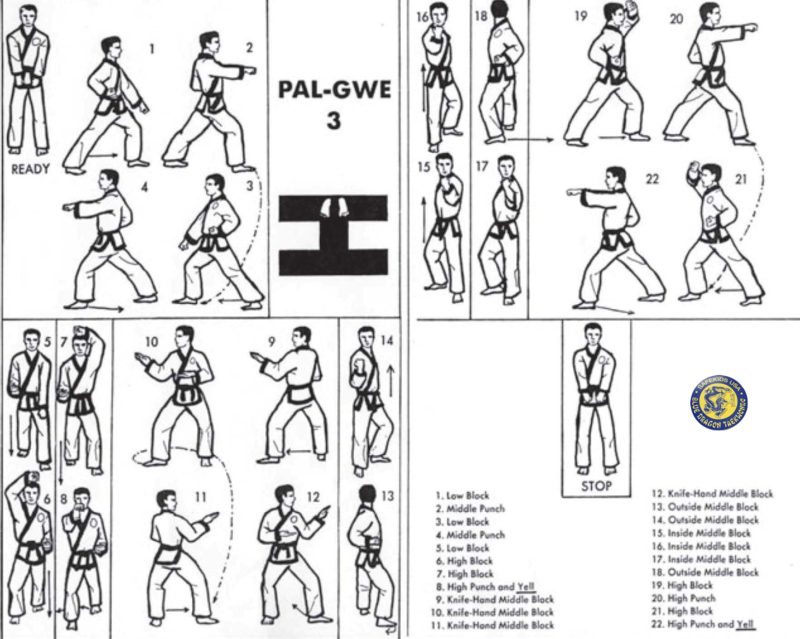 Left turn 270° counter clockwise (East), left back stance, double knife hand middle block (Dwit Kubi Sonnal Momtong Makki). Step up right back stance, double knife hand middle block (Dwit Kubi Sonnal Momtong Makki). Right turn 180° (West), right back stance, double knife hand middle block ((Dwit Kubi Sonnal Momtong Makki). Step up left back stance, double knife hand middle block ((Dwit Kubi Sonnal Momtong Makki). 90° left turn (South), left back stance, left inside block (Dwit Kubi Momtom Yop Makki). 180° right turn (North), right back stance, right inside block (Dwit Kubi Momtong Yop Makki). Step back left back stance, left hand outside block (Dwit Kubi Momtong An Makki). Step back right back stance, right hand outside block (Dwit Kubi Momtong An Makki). Right turn 180° (South), right back stance, right inside block (Dwit Kubi Momtong Yop Makki). Left turn 270° (West), left front stance, left hand high block (Ap Kubi Olgul makki). Step up right front stance, right hand high punch (Ap Kubi Olgul Jureugi). Right turn 180° (East), right front stance, right hand high block (Ap kubi Olgul Makki). Step up left front stance, left hand high punch. KEUP! (Ap kubi Olgul Jiregi). Left turn 90° (North) to starting point, left foot steps back. Assume ready stance.